41 employees (including 4 supervisors) of a human services non-profit in Delaware County have been charged in an overtime rigging and kickback scheme. 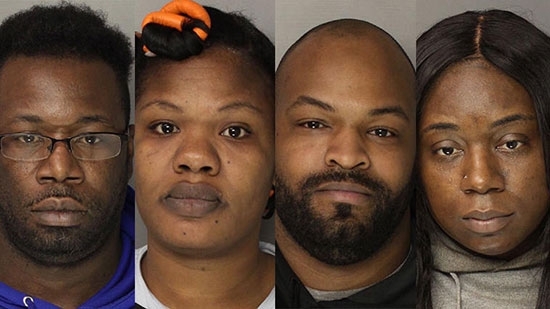 They are all accused of stealing nearing $1 million from the Elwyn Organization over a 21-month period. The supervisors would adjust employee's time sheets and add overtime hours. The employees would not actually work the overtime. In turn, they'd kickback some of the extra pay to the supervisors. The supervisors charged have been identified as 40-year-old Tyloneous Wilson, 34-year-old Karriemah Williams, 36-year-old Lakiea Gay, and 28-year-old Terrance Chatman. "In 2017, Elwyn launched a leadership transition designed to create a path to long term success and sustainability for the organization. Later that year, Elwyn became aware of some irregularities in payroll record data. Elwyn management notified the Pennsylvania State Police and conducted an internal investigation which ultimately determined that 4 supervisors and 38 of their direct reports in Elwyn's Pennsylvania residential program participated in a payroll fraud scheme resulting in significant theft from the organization. All involved employees were terminated and Elwyn fully cooperated with law enforcement and the District Attorney's Office. Elwyn remains committed to the safety of the individuals we support," said Charles McLister, president and CEO of Elwyn. Elwyn was founded in 1852. It provides a variety of services to adults and children with developmental and intellectual disabilities and more. Both the prosecution and the defense rested their cases on Wednesday, 1/16, in the trial of Josh Hupperterz for the murder of Temple student Jenna Burleigh. Hupperterz did not take the stand in his own defense. The trial started last week with Hupperterz pleading guilty to abuse of corpse and tampering with evidence, but not guilty to murder. Prosecutors say that Hupperterz and Burleigh met at a bar near Temple's campus on August 31st. They left together and went to his apartment nearby. That is where investigators say Hupperterz beat, strangled, and stabbed Burleigh to death. He placed the body in a plastic storage container and took a ride share to his grandmother's house in the Poconos where he left the body in a shed. The prosecution presented evidence and testimony to support that case. The defense tried to say that Hupperterz's roommate, Jack Miley, committed the murder. Miley testified that he was intoxicated that night and went to sleep and did not hear anything. Closing arguments will be made on Thursday morning. Police in Delaware County are warning businesses of high quality counterfeit $100 bills that have been circulating. Media Borough Police posted a photo on Facebook of the fake bills. They all have the same serial number "E 05201634 A." Police say they will pass a marker test, so pay attention to that serial number. If you believe you have come across one of these bills, call Media Borough Police at 610-565-6656.